When it comes to advanced grammar checking, Google Docs literally has fewer options when Microsoft Office Word enjoys a little more. 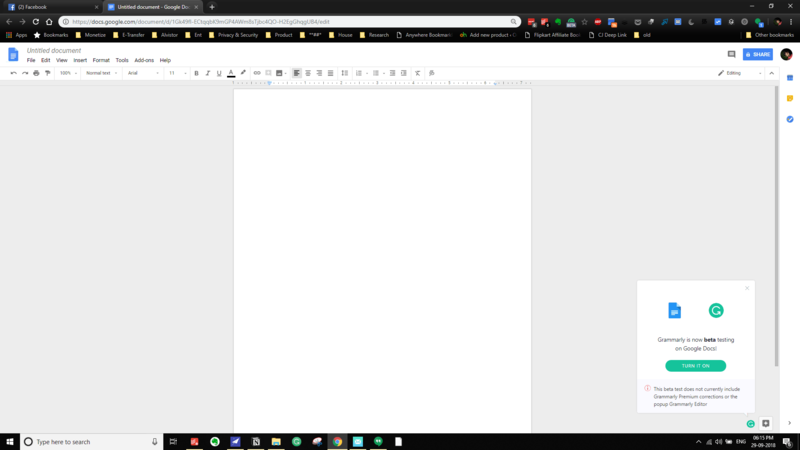 Google Docs is my primary choice for my documenting needs, yet MS Word overtakes the choice when I wanted a more professional English in my writings. MS Word’s default grammar and typo checking feature serve your basic needs, while Grammarly helped me to perfect it. Google recently announces the launch of its own “New grammar suggestion tool” powered by machine learning aka A.I. (Artificial Intelligence). The feature is a topping to the existing Spell checker in Google Docs. With this, Google now highlights the possible grammar errors with solid suggestions to correct it. So you can spend less time proofreading your texts. As the functionality is backed by machine learning, the error checking accuracy and suggestions will be far more advanced and obviously keep on evolving. I suspect, there’s a possibility for personalized suggestions based on your previous writings. Docs uses machine learning technology to recognize and help correct potential grammar errors in real time. Docs already uses intelligence to help you assign action items, find relevant content, and identify spelling mistakes. – from G Suite updates blog. The feature is now only available to G Suite users, and that too for the organization who signed up for the Early Adopter Programme (EAP). If you’re a G Suite customer, ask your IT admin to fill this G Suite Docs Grammar Early Adopter Program Application to taste the feature even before everyone. Hope the other users get this feature early next year (Fingers crossed). 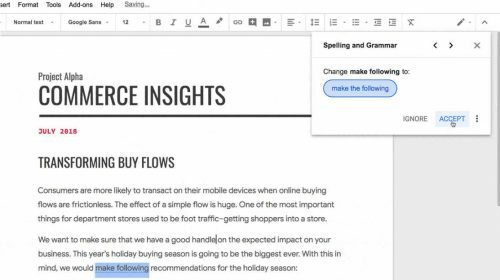 Google Docs is now blessed with the support from Grammarly. 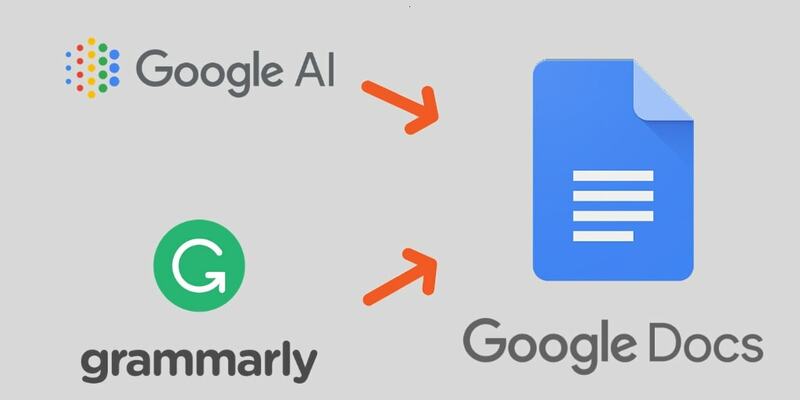 Everyone who has Grammarly Chrome extension has now started to receive the ‘Beta’ version of Grammarly for Chrome in Google Docs. Grammarly is the service I rely on these days to proofread my contents and I have its support inside MS Word with a plugin. One pit in the Google Docs is the lack of integration with Grammarly. As the deterrence gone now, Google Docs has taken its primary place of choice in my workflow for document editing. 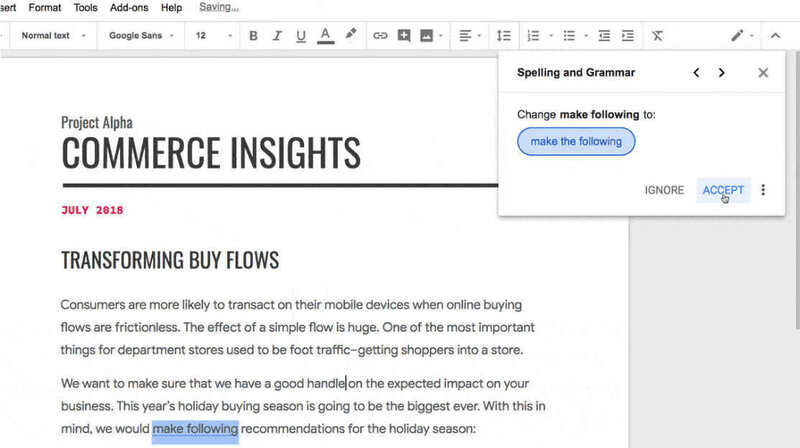 Load a document in Google Docs and click the Grammarly extension button.